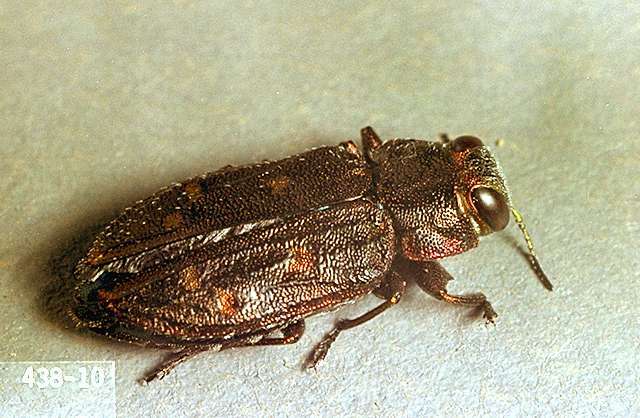 Pest description and crop damage The Pacific flatheaded borer is a pest of many different trees and shrubs, including most fruit trees. Adults are reddish bronze beetles with copper spots on wing covers, and about 0.25 to 0.5-inch long. 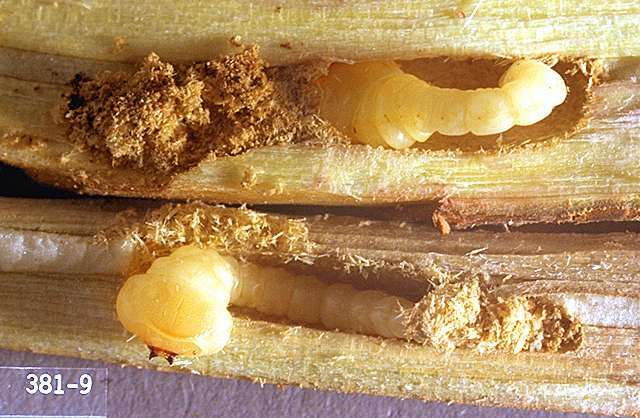 Larvae are whitish to pale yellow and about 0.5 inch long when fully developed. The area behind the head has a broad, flat enlargement giving the larvae their "flat-headed" appearance. Larvae feed beneath the bark and may girdle the trunks and branches of trees. Young, recently planted trees are most susceptible. Trees that are stressed because of drought or other causes are especially vulnerable. Biology and life history The insects overwinter in host plants as mature larvae. In spring, they pupate and then bore holes in the tree. They emerge usually from May to June. Females lay eggs from June through July in crevices in the bark, usually on the sunny side of tree trunks below the lowest branches. Stressed trees are the preferred egg-laying site. The larvae hatch, burrow into the wood, and feed on the cambial and vascular tissues until fully grown. Burrows are characteristically broad and irregular. Pest monitoring Watch for depressions in the bark or cracks through which frass (excrement) may be seen. Birds peck the larvae from under the bark with their beaks. Some wasp parasites attack the borer. Carpenter ants eat both larvae and pupae from the wood. Beetles are attracted to weakened, sunburned, or injured parts of trunks and lay eggs in cracks on bark exposed to the sun. Protect young, newly planted trees from sunburn by whitewashing with an interior white latex paint. Paper trunk protectors or boards also may be used to shield the trunks from sun. Limit summer pruning of mature trees to September and early October. chlorpyrifos (Lorsban 75WG) at 2.0 to 2.67 lb/a. REI 4 days. Do not exceed one application of chlorpyrifos as a dormant or delayed-dormant per season. Avoid contact with foliage in sweet cherries as premature leaf drop may result. Extremely toxic to fish and aquatic invertebrates; avoid spray drift and runoff to surface waters. esfenvalerate (Asana XL) at 4.8 to 14.5 fl oz/a. REI 12 hr. PHI 14 days. Extremely toxic to fish and aquatic invertebrates; avoid spray drift and runoff to surface waters.